Hi all, Sorry for being a beginner. I spent a good amount of my weekend confused about this problem. After reading around I saw this pin is also used for i2c stuff and has 18k pull-up resistor to 3.3v. Not sure what is the implication of that for using it as a GPIO output. Does that mean I cannot control a LED with it? Then Why does it work sometimes but not other times? Btw I2C is disabled on my board. Thanks for your help! Last edited by bowen1506 on Tue Apr 16, 2019 2:45 am, edited 3 times in total. This is NOT possible, for several reasons, three reasons in fact! First, You cannot just connect a LED between a GPIO pin and GND, as a LED is a diode, and needs a resistor in series to limit the current flowing through it, or it will draw an "unlimited" amount of current. meaning it draws so much current that it will probably draw the 3V3 supply down to the typical forward drop voltage of the LED, a RED LED has a forward voltage of ca 2.0Volt, and sinking 3V3 to 2V will crash or destroy your PI. Secondly luckily you made another mistake in using a BLUE LED, blue LED's have a much higher forward voltage of 3V or so, and so are typically not suitable to be driven by a GPIO, not even with a resistor, without a resistor they will draw current until the source drops to 3V. Thirdly the GPIO pin you are using isn't suitable for driving a LED, as its one of the two GPIO's reserved for I2C, and both of them have permanent 1600 Ohm external pullups attached to them. Choose another GPIO pin, one not dedicated to a special function,(say GPIO 27) and put a 330 Ohm series resistor in series with a RED LED. This NOT possible, for several reasons, three reasons in fact! Thanks for the reply. I am pretty new to this stuff so sorry for the noob questions. Why do you think I should use a red one instead of blue? I don't intend on using any i2c peripherals that's why I soldered onto that pin...It is also a GPIO pin nonetheless right? Is it because of the pullup resistor it has that is preventing it from driving an LED? Yes, and the table shows that is at 20mA current. GPIO pins can supply a maximum of 16mA, but that is not guaranteed to be at 3.3V, it is only certain that it will be at a voltage that will be considered a "logic high" which is about 2V. With a small resistor you might get your LED to light sufficiently from a GPIO, but it would be better to use a driver circuit and run it from the 5V supply via a suitable resistor. You are misreading the spec. 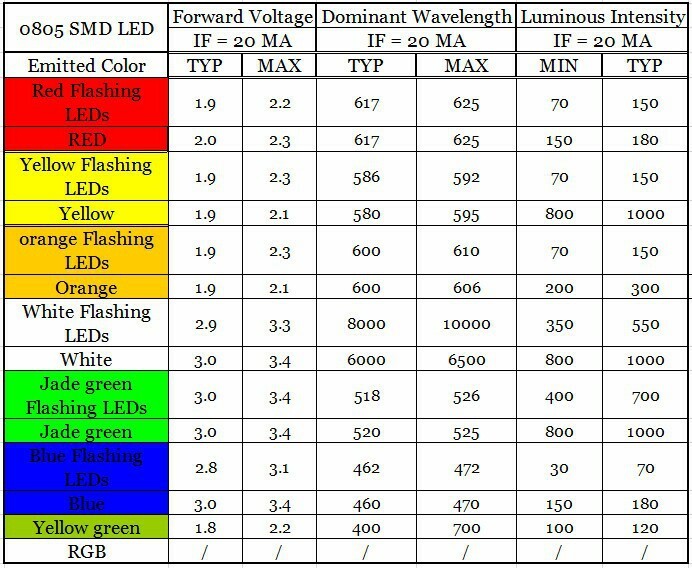 It says that, when the current is 20mA, the voltage will be typically 3V0, max 3V4. That means if you apply 3V3 without a resistor, typically the current will exceed 20mA. That is enough to damage your Pi. It is quite possible that, if the LED is connected the right way round and you managed to program the GPIO as output high, the GPIO is already damaged, and such damage can spread through the SOC even after the LED is removed. Alternatively the 3V3 supply may have been pulled down, limiting the current to a value that did not cause permanent damage. Because the forward voltage drop is lower, assuring that the Pi will deliver enough voltage to turn it on. You still need a current limiting resistor, which will effectively drop the difference between 3V3 and the LED Vf, thus limiting the current according to Ohm's law. Is it because of the pullup resistor it has that is preventing it from driving an LED? No, the pull-up will actually prevent the LED turning off completely. Have you not understood what people have been telling you , you can not drive a blue LED directly from a gpio pin with no limiting resistor , you will eventually damage you pi to the point were it will not work at all. I suspect what you are seeing is the pi failing after 40 min due to the excessive load on the gpio resulting in the gpio output failing , applying the external 3v is not actually fixing it , it more likely the time its un-powered allowing the output driver to cool and recover. If you are not going to listen to the excellent advice given then at some point you will be back say your pi has failed , you have be warned. Yes I fully understood that point and I said it in my last post. What I was puzzling about was the external 3v somehow "resets" the pin. I am sure it is not the un-powered time that is allowing it to recover, I've left it off for a day and it did not recover, whereas if I apply 3.3v external power to the led and it lights up, the pin is fixed immediately. But anyways, thanks to everyone for the help, I have already de-soldered the led and the pin works again. Next time I'll be sure to add a resistor in series when driving led from gpio.